It's pitch-black and I'm standing on the shores of Valugan in Batanes. With my trusty torch in hand... I made my way towards the distant sound of crashing waves... towards the eerie sound of boulders rubbing against each other... as wave after wave pounded the craggy shore. I'm in hot pursuit of an image in my mind. Valugan beach is right on the eastern seaboard of Mt. Iraya, where its tears from ancient volcanic eruptions flowed down into the sea. 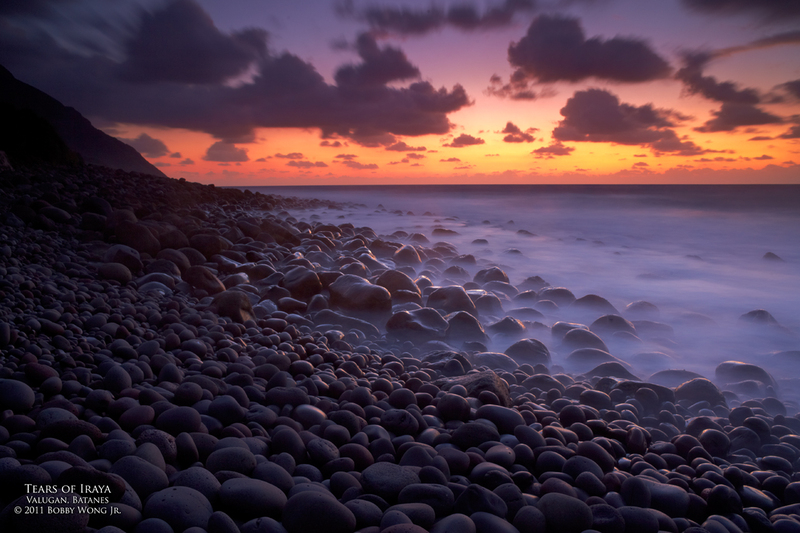 Over time, violent waves patiently sculpted these tears into smooth round boulders by rolling them against each other. The struggle between those epic eruptions and the relentless sea created the visually stunning landscape we see today. How to tell this story in a single photograph? I thought I'd position the foot of Mt. Iraya inside my composition, after all, the volcano is my leading lady in this story. It's tears, now ground into smooth boulders, will be my foreground... creating an endless expanse of interesting shadows and textures. Then under the glowing colors of an imminent dawn, I took a long enough exposure to turn the violent waves into a wispy, dreamy, cotton-like blanket of a mist... to portray the sea's untiring labor over the millennia. Have I succeeded by even a bit? Let me know. Enjoy. Nice stone-scape! Got to see something like this at a beach in Muros, northern Spain. Didn't have any camera with me then.Thanks for sharing. beautiful shot Bobby. Very good. Breath-taking shot sir! totally awesome!! !